DAYTONA BEACH, Fla. — Race cars are back on track. 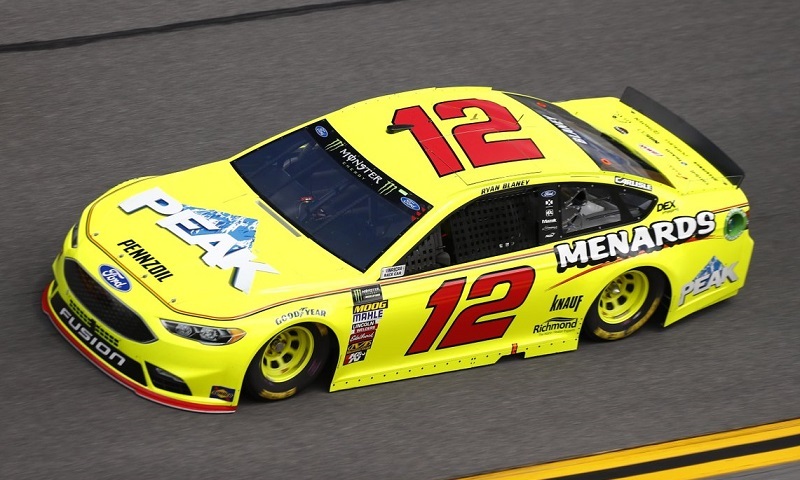 It’s finally Daytona Speedweeks and Monster Energy NASCAR Cup Series drivers were able to shake the offseason cobwebs and break to the highbanks for the first time on Saturday morning, debuting new schemes and lineups for multiple teams. After a long and interesting offseason, both pole winners and playoff drivers from last season took to the World Center of Racing for a single practice session in preparation for tomorrow night’s Advanced Auto Parts Clash, a 75-lap exhibition event. During the 90 minute session, the 17 eligible drivers took to the circuit, headlined by the newest addition to the rulebook — no required ride heights (how high or low the car is from the ground) for superspeedways. Taking advantage of the revoked ride height rule, teams had their cars slammed to the ground, allowing speeds to be higher than ever with a restrictor plate. Taking his first on-track laps in the No. 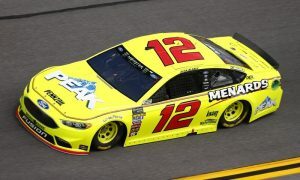 12 Menards Ford, hotshoe Ryan Blaney paced the practice leaderboard at 199.601 mph (45.090 seconds), utilizing a draft from Team Penske teammates Joey Logano (45.103 seconds) and Brad Keselowski (45.115 seconds), who were second and fourth on the charts when the practice concluded. Following two restrictor plate race wins last season, Ricky Stenhouse Jr., piloting his No. 17 Fastenal Ford for Roush Fenway Racing, was third on the speed charts. He is competing in his first-career Advance Auto Parts Clash. Looking for his first superspeedway triumph, Kyle Larson closed the top five speeds in the session. Kasey Kahne, Kurt Busch, Kyle Busch, Denny Hamlin and Erik Jones made up the top ten positions. Tomorrow’s Advance Auto Parts Clash is scheduled to start at 3:00 p.m. Eastern with live coverage on Fox Sports 1, Motor Racing Network (MRN) and SiriusXM NASCAR Radio). The lineup for the Clash will be determined by a random draw. Meanwhile, all teams competing in the Great American Race, which is slated for Sunday, February 18th, are scheduled for two practice sessions later this afternoon. The first official practice is set to start at 1:05 p.m. Eastern, with live coverage on Fox Sports 1. Marshall Gabell is the Mid-Atlantic Correspondent for Race Chaser Online, and handles public relations needs in multiple outlets of motorsports, including for tracks and drivers. Gabell is currently attending Stephen Decatur High School in Ocean City, Maryland, completing his junior year. He is 17 years old.